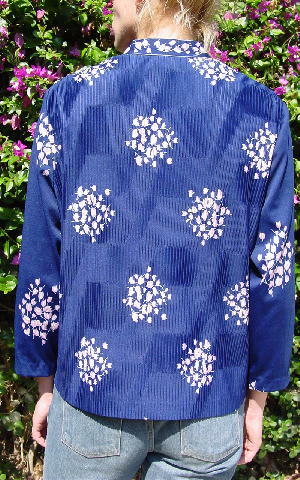 This vintage navy blue 100% polyester Hal Ferman blouse has a vertical ribbed tone-on-tone pattern and freeform circles of light mauve and white tulips. 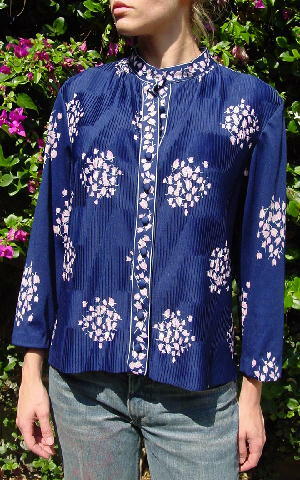 It has a 1 1/4" band collar and two 1 1/4" plackets down the front (one has the buttons and the other has the buttonholes) with tulips all the way around. 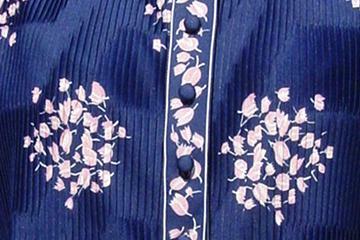 The sleeves do not have any ribbing. It has an Asian feel to it. She wore it a few times in the winter in Miami as a jacket.